TIGERLIM.COM: "Nasi Katok vs Ayam Penyet"
"Nasi Katok vs Ayam Penyet"
Who say we need "Luck" for masuk final!!!! Look what we got now is the victory and take down Myanmar. If fact id the Brunei team just slowly passing the ball to pull the time, the final score is 1-3 one!!! Anyway... We Brunei still masuk the Final wat!!!! hahaha. It was the great match... I have long time never see Brunei have happy about the football sudah! The last time I still remember one is the year Brunei win the Malaysia Cup. 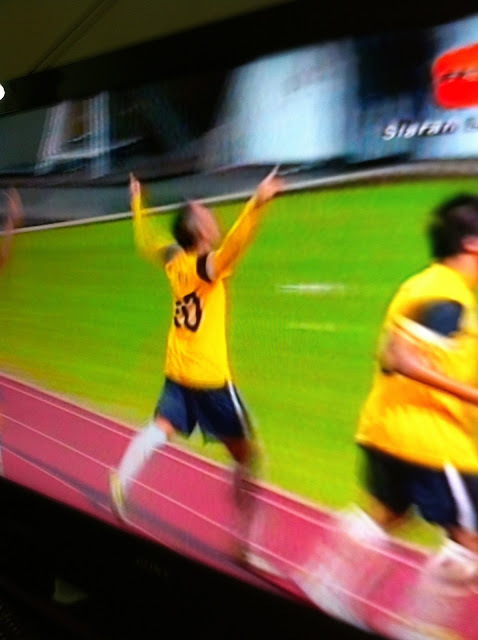 Brunei team you are the best and win for the last match!!! It was really awesome and see the National Stadium full house.... Tonight I think is the most full of people for the past ten year... Am I right. So on the Final day I think is gonna more people in the stadium lagi. Sure the stadium got a lot of Indon supporter one that day!!! Hopefully everyone play in Peace and Friendly. No fights and hates for both team supporter. Once again congratulation to our Brunei team enter the Final!!! Do We Still Have Tp Pay If Broke It? I'm Not A Good Driver!!! What Name Is For The New iPad? TIGERLIM.COM All Rights Reserved. Don't play play oh.If you copy my image,video,article or what so ever lah with out my acknowledge,permissions. Sure you kana the durian hit on your head.